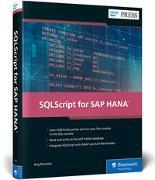 Developers, your complete guide to SQLScript programming for SAP HANA is here! Get hands-on with the SQLScript language, understand the data types you'll work with, and master the function library. Learn to implement SAP HANA database procedures and functions using imperative and declarative SQLScript. See how SQLScript plays with ABAP, SAP BW on SAP HANA, and SAP BW/4HANA. Finally, optimize, troubleshoot, and analyze your SQLScript programs. a. SQL Language ElementsSee how to develop simple SQL routines, and learn about the key elements of SQLScript, the data types of SAP HANA, and declarative and imperative programming. b. SQL Function LibraryMaster the most important functions of the SAP HANA database, including aggregate functions, string functions, and type conversions.c. SQLScript in SAP ApplicationsLearn how to integrate SQLScript procedures into ABAP, SAP BW on SAP HANA, or SAP BW/4HANA programs.